Dealing with people who exhibit passive-aggressive behavior is easily one of the most challenging aspects of our social lives. Here’s what you need to know about this annoying personality quirk and how you can handle people who express their hostility in indirect and backhanded ways. Interacting with passive-aggressive (PA) people is something many of us are all too familiar with. As a behavior, it manifests in many different ways — some of them quite backhanded and subtle — which can make it difficult to recognize. Simply put, passive-aggressiveness is a way of expressing hostility, albeit through typically muted, seemingly apathetic, and indirect channels of negative behavior. It can involve everything from the passive resistance of everyday social and work-related tasks (e.g. procrastination, learned helplessness, deliberate inefficiency, and forgetfulness) through to stubbornness, resentment, and contradictory behavior (e.g. appearing to be enthusiastic about something, but purposefully acting in a way that’s unhelpful and sometimes damaging). Though no longer recognized by the American Psychological Association (APA) as a formal personality disorder (more on this later), it’s something we all have to deal with — both as something that happens to us, and as something we do to others. While it’s crucial to avoid the pathologization of every single behavior that makes us feel bad, threatened, or irritated, it’s important that we still be able to recognize PA behavior when it happens, and understand the most effective ways to deal with it. But before we get into that, let’s take a look at the rather surprising history of this thing we call passive-aggressive behavior. Having logged the quirks of servicemen, however, psychiatrists soon began applying the same charges virtually unaltered to civilians. As it readied the first edition of the Diagnostic and Statistical Manual of Mental Disorders for publication in 1952, the APA simply copied the relevant phrases from the military memo and gave them diagnostic codes. Indeed, it adopted the same practice for a large number of behaviors and ailments, making the temporary frustration of the U.S. War Department a basis for establishing lasting pathologies in the population at large. APA soon broadcast that the businessman or housewife with a “passive aggressive personality” revealed a pathologic “trait disturbance.” Marking a clear deviation from normalcy, their behavior was thus a syndrome that might recur if left untreated. The APA was not simply overdramatizing routine behaviors; it was relabeling them malfunctions of biology and neurology, the direction in which American psychiatry overall was heading. The standard was thus set. For nearly four decades, “passive-aggressive personality disorder” (PAPD) was considered a formal DSM pathology. It was finally dropped from the DSM-IV in 1994. After much debate, it was agreed that, as a personality disorder, it was too narrow, situational, and behavioral to warrant a full-blown diagnosis. What’s more, the APA didn’t think there was enough scientific evidence to back it as a distinct disorder and that it significantly overlapped with other disorders. Instead, the disorder was diluted, renamed Negativistic Personality Disorder (NEGPD), and appendicized in the DSM for future consideration and study. Symptoms continued to include passive resistance to routine social or work tasks, complaints of being misunderstood, a disdain for authority, envy, and resentment. But under the new name, it could also include negative moods and other non-specific personality issues. Since then, some psychologists have expressed their dissatisfaction with the omission. Psychologists Christopher Hopwood and Aidan G. C. Wright say the re-classification and focus on “negativistic ideas” has done much to undermine and undervalue the condition formerly known as PAPD. They claim that the focus on negativity, both in PAPD and NEGPD, has both altered and diminished the usefulness of the concept at the clinical level. A 2009 study in the journal Psychiatry reached a similar conclusion, arguing that “PAPD is a useful clinical construct that deserves careful consideration in clinical assessment and may merit further consideration in discussions of [personality disorders]. With all due respect to these studies, it’s safe to say that PA behavior is problematic and annoying. But whether it deserves to be defined as a bona fide mental illness — and subsequent stigmatization in society at large — seems debatable. Calls to restore its place as a formal pathology are indicative of the struggles of psychiatry to justify its (often qualitative, normative) definitions of mental illness. It’s important to draw a line between pathologizing PA behavior and figuring out how to deal with difficult individuals in one’s life. What’s more, it risks pathologizing compliant defiance in the face of authority, whether it be work-to-rule actions, the Occupy Movement, or (sadly) a potentially abusive home or work environment. All this said, there’s no denying that passive-aggressive behavior exists and that it poses a challenge for many of us in our daily lives. Though expressed in different ways, it typically involves non-verbal aggression that manifests as negative behavior. Examples include answering “yes” or “no” to an either/or question, deliberately “forgetting” to send an email attachment, or avoiding communication when there’s clearly something important or problematic to be discussed and resolved (storming off or leaving notes are prime examples). But in time, she said, it was apparent that he was also passive-aggressive. On one occasion, she said, he gave away her seat on an airplane while she was finding a storage compartment for her luggage, saying he thought she had taken another seat. On others, he would arrive home early from work and finish off meals they normally shared, without explanation. And when he was in one of his moods, the listening ceased; she may as well not have been in the room. As noted in the NYT post, one of the most challenging things about living/coping with a passive-aggressive person is that one struggles to understand what they did wrong. Withdrawal - of material support, contribution to shared goals, Re-prioritizing alternate activities and goals, “go-slow’s”, procrastination or targeted incompetence. Silent Treatment - inappropriate “one-word” answers, inattention, making yourself generally “unavailable”. Off-line Criticism - propagating gossip or criticism to a third party in an attempt to negatively influence the third party’s opinion of a person. Sarcasm, Critical and “Off-Color” Jokes - Humor which targets a specific individual is a form of Passive-Aggressive communication. Indirect Violence - shows-of-strength such as destruction of property, slamming doors, cruelty to animals in the sight of another is passive-aggressive. As an aside, passive-aggressive personalities often bear resemblance to pathological narcissism, including the expression of such traits as an exaggerated sense of self worth, lack of impulse control, an inability to empathize, and a sense of entitlement. The precise causes of passive-aggressive behavior are not known, but it’s likely on account of both environmental and social factors. In a 2001 study, the heritability of passive-aggressiveness was estimated at 50% in school-age twins (a highly contentious conclusion, to be sure). It has also been associated with a number of social/environmental factors, including ineffective parenting behavior, child abuse, harsh and apathetic parenting, and neglect. First-born children are prime candidates, [says Dr. Lorna Benjamin, co-director of a clinic at the University of Utah’s Neuropsychiatric Institute in Salt Lake City]. [W]hen younger siblings are born, the oldest may suddenly be expected to take on far more extra work than he or she can handle, and over time begin to resent parents’ demands without daring to defy them. In terms of risk factors, PAPD has been associated with an increased risk of depression, anxiety disorders, and substance abuse. As noted, it also shares characteristics with narcissistic personality disorder (NPD). This is interesting because NPD has been linked to fear and decision making processes. Both conditions (such as they are) are characterized by avoidance. 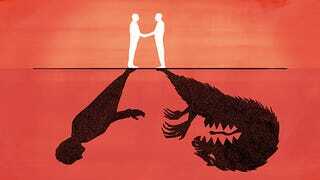 In the case of NPD, it’s the fear of dark and negative self-experiences; in the case of PA, it’s the avoidance of direct confrontation and the preference for passive, hostile acts. Neurologically, there may be something going on in the amygdala, the part of the brain that controls processes like the detection of emotionally arousing and relevant stimuli. There may also be a connection to the prefrontal cortex, the part of the brain responsible for control and our ability to act in socially appropriate ways. Biological alterations or damage could contribute to any number of socially problematic behavioral patterns. In order to deal with passive-aggressive people, it’s important to know why they’re acting that way. Living, working, and interacting with passive-aggressive people is not fun. Thankfully, there are some things you can do to intervene. One good reflection of what works and does not work are your feelings after a conflict. If you end up feeling helpless, powerless, angry, and confused, your methods have not worked and you should change them. If you end up feeling calm, the [PA person] has regained composure and you believe that they may have learned something to help improve behavior, your methods are an effective way of dealing with [them]. In short, drop what is not working and identify methods which are working. Other tips: Don’t allow yourself to be manipulated, stay emotionally calm, and don’t respond with your own set of passive-aggressive tactics. Also, do something healthy and productive for yourself. Generally, the feeling that you feel from the individual that is acting out passive-aggressive can give you some information on what they are trying to communicate; however, the goal is to not trouble yourself with reading into the implied message. The idea is to communicate in an assertive way. Be matter of fact, avoid gossip, cold shoulders, huffing and puffing. Indeed, sometimes it’s best to initiate the conversation and tell the other person that they can always speak directly to you if they have an issue. The practice of leaving notes or hinting at things in an obfuscating or abstract way doesn’t really help the situation. It’s also important to realize that you probably won’t be able to change the person. What you can do, however, is establish the normative parameters as it relates to your interactions with them. Your PA friends, co-workers, and family members may eventually learn that the best way to engage with you and address contentious issues is to avoid passive-aggressive behaviors in favor of more direct methods. But this will only be possible over time and with great patience and consistency on your part. That said, it’s important to model constructive behavior, hand out heaps of positive reinforcement, and cooperate and negotiate in ways that’s fair to both of you. Additional reporting by Levi Gadye. This article originally appeared at io9 on January 22, 2015.